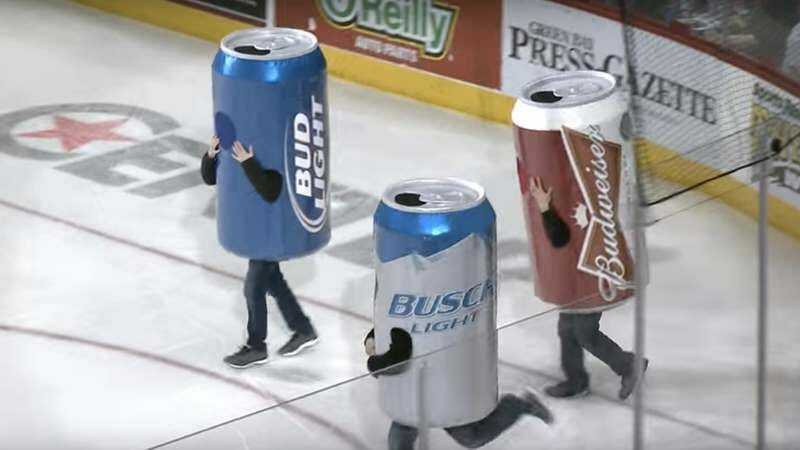 The word “hero” gets thrown around a lot, but rarely have we seen the kind of fortitude, the kind of stamina, the kind of 110 percent effort evident in this beer-can mascot race at a Green Bay Gamblers hockey game. First posted last year, the video recently started making the rounds again—on Digg, for example—undoubtedly for its undeniable inspirational factor. Already the outsider facing off against beer bros Budweiser and Bud Light, Busch Light goes down almost right out of the gate, and is seemingly out for the count. But wait, what’s this? Busch Light then comes out of nowhere to take the lead, flying past even some unnecessary roughness from the Budweiser can on his way to victory. Granted, about half of this minute-long video appears to involve trying to help the poor Busch Light beer can up off the ice as he slid into his winning, yet horizontal, position. But we could all take a lesson from this brave, undaunted soul, who hopefully got up, defrocked out of his heavy costume, and celebrated his unexpected victory. Preferably with a better beer than Busch Light.